Judy, suggested the other day that it would be good for us to make Alzheimer's Art Quilt Initiative quilts. Let’s Continue Our Heritage…Pass It On! How many of you have taught someone to quilt, or a new technique so far this year? I enjoyed learning something new during the MQA Educational Seminar in July with Marilyn Doheny. I wasn’t sure what I was getting myself into but once there, I was truly glad I jumped in. She was a fun teacher and I think we all had a good time. Next year’s teacher will be Nancy Mahoney and the dates are July 15-20, 2013. Class information will be determined a little later on. Something that I’ve been wanting to participate in is the Alzheimer’s Art Quilt Initiative. If you haven’t been personally touched by Alzheimer’s (Mother, Father, Grandparents), I’m sure you know someone who has. The money received from the auctioning of these little quilts goes toward Alzheimer’s research which will benefit us in our future. I’d like to challenge you to make a donation quilt (maximum size is 9” x 12”) and bring it to show during the Fall Gathering in Cleveland. You can choose any theme but a “Delta” theme would fit right in with Cleveland’s programs for the weekend. Please check out www.alzquilts.org for the complete list of instructions and rules to follow. I’m looking forward to seeing you in Cleveland October 19 and 20. And, don’t forget the Pine Belt Quilt Show October 5-7. Also, the Spring Gathering will be in Meridian MS. February 8th and 9th, 2013. Mark your calendars. Judy's mother suffered from that horrible disease and so did my Uncle Arnold. So I am trying to come up with an idea of a small 9 x 12 inch quilt to represent a wonderful man who always made me feel so welcome in his and Aunt Martha's home. In the meantime, I am posting a link to their website for anyone else who would be interested in honoring those in their lives that have had their minds stolen by Alzheimer's. 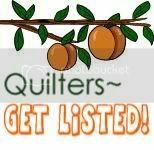 So if you are interested here is a link to their site and the guidelines for producing a quilt for their fundraising. AAQI. The AAQI (Alzheimer's Art Quilt Initiative) gives a great method for preparing a small quilt for hanging. I have posted a link to their site. To see how to do it click here. Today a large group of the Possum Town Quilters got together and worked on blocks for the Freedom from Cancer quilt that we will be donating to the Lowndes County Relay for Life group. We were making two of the blocks from Amy Gibson's class on Block of the Month from Craftsy.com. We had decided to buy pizza for lunch, so no one would need to prepare lunch for everyone. We had about 22 people show up. The challenge committee was working on the opportunity quilt we donate to the Arts Center for our "rent". Lots of progress was made on both. We only need a few more blocks on the Relay for Life quilt and the challenge quilt was in the beginning stages of assembly. Woooooot!! So proud of how hard everyone worked. So without further ado pictures from the day. Mary Anne, Sandi, Lory, and Linda working on blocks. Brenda was working on the challenge quilt for the RAC. Linda and Carol working hard. Ebba was ironing and arranging the blocks on the wall so we could keep track of how many more we needed. Julia and Emily (not pictured) were working on the challenge quilt too! And by the end of the day, we had most of the blocks made. Several ladies agreed to make a few at home. Please email me and let me know how many of what you are making so I can make sure we have enough of the right blocks. If we have extra that is ok they can go with Annette's blocks for the quilt of valor. ;-) We also got the back pieced and ready to go. So at our next meeting, I propose that after lunch we team sew the rows together, add the border and be done! I finished both Craftsy Block of the Month blocks now, but for the life of me I don't know where I put the other block. This one was not easy but it is done. I like this one better than the other one. This is one of block of the month. Found the other one...it was on the bottom of the stack of fabric I have been using on these blocks!! It is like the lost sheep...rejoicing here, till I looked at it closer. Now I think I need to redo it...ugh. For one of our demo's this month I showed how to make a quilted postcard. I made this for that purpose. Finished it up after I got home, and wanted to post pictures of the finished product. I draw a line down the middle, and then put lines on the right side for addresses and a place for a stamp. I sew the quilted picture to a piece of heavy weight watercolor paper. One of the ladies at the meeting said she didn't understand what I was saying in the previous post on how to do the blocks for the Freedom from Cancer quilt that we are going to donate for relay for life. I have gone back and (hopefully) clarified the write-up. So please go back and reread that post and leave me a comment if anything is unclear. Thanks!! This Saturday (September 15) is our regular guild meeting. While we will not start this project till our regular sit and sew day at the end of the month, I thought I would blog about the plans so if any can't make the sit and sew and would like to participate, they could drop off their pieces. We are going to make the blocks from the June Craftsy block of the month. Setting them without sashing as a two block quilt. I drew out 9 blocks so you could get an idea of what it would look like. We are going to use Red White and Blue fabrics in tone-on-tone prints. We want to try to use red, white and blues that are similar in color to the flag. Whites need to read as a white from a distance. Small polka dot or star on that in red or blue would not matter. I am envisioning this very scrappy. So my thought is that if we each bring a fat quarter or two or 4 blocks cut out, then we can mix and match pieces so each block is really scrappy. I also was thinking a pieced border would be neat. So I am thinking it will be 7 X 8 12 inch blocks with a 2 inch inner border and a pieced border of 4 inch blocks (finished). So that will make a finished quilt of 96 x 108. Between a queen comforter and spread. Watana has generously agreed to quilt this. And drum roll, if we make enough blocks for a quilt of valor too...Mary Anne has said she would quilt that. So here is what I am asking you to do, Cut your material before you come. If you cannot come, you could help by cutting your blocks, making your half square triangles and Greek cross units and bring them to our meeting or get them to one of our members before the next meeting. For the 4 blue/white and 4 red/white 1/2 square triangles. Draw a line down the middle of the white squares and pair with blue and pair with red squares then sew 1/4 inch on either side. Cut on the line and press open. Square up to 4 1/2 inches each. This should yeild 4 blue/white 1/2 square triangles and 4 red/white 1/2 square triangles. These will be used as 4 1/2 inch squares. sew together on the long sides and cut into 4 1/2 inch pieces. That will be enough for two blocks and one block each of red, white and blue for the border. 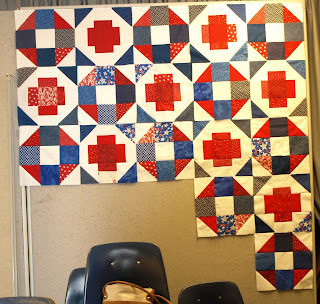 If want to cut enough for four blocks you can cut one less red white and blue block. So I am asking for two blocks for the freedom from cancer quilt, and if you feel moved two more for the quilts of valor quilts. I started quilting when my son needed a bedspread when he was in 2nd grade and we couldn't find a bedspread he liked. Since then I have made between 1 and 4 quilts a year. I also like to build things and find innovative ways to make my quilting experience wonderful. My children are grown and I am so proud of the adults they have become. When I am not quilting I spend most of my time at the local high school teaching math. I also love my church, walking and to playing tennis.